Is Holocaust Denial Really about the Holocaust? You are here: Home / Antisemitism / Is Holocaust Denial Really about the Holocaust? In 2005, The United Nations General Assembly passed Resolution 60/7 to officially choose January 27 as the International Day of Commemoration in memory of the victims of the Holocaust. 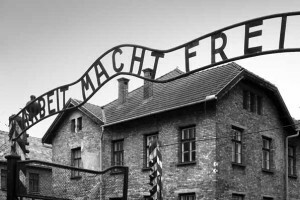 This is the day when the world is supposed to mark and remember the Holocaust and its victims. 2016 marks the 71st anniversary of the Liberation of Auschwitz-Birkenau. Today more than ever, the motto NEVER AGAIN needs to be repeated to older generations and taught to the newer ones. as very few of the Holocaust survivors remain alive today, we run the risk of forgetting one of the most–if not the most–tragic genocide of human history. This date is different from the Jewish commemoration of Yom HaShoah that takes place each spring in Israel. The International Day is an event sponsored by the United Nations. Even though I have lost faith in the ability or even the willingness of the UN to deal with Israel fairly, I appreciate UN Secretary General Ban Ki-Moon’s statement about this event: “Denying historical facts, especially on such an important subject as the Holocaust, is just not acceptable. Nor is it acceptable to call for the elimination of any State or people. I would like to see this fundamental principle respected both in rhetoric and in practice by all the members of the international community”. Of course, with all the pressure applied at the UN by many countries who are vowed enemies of the Jewish State, the tug-o-war between historical accuracy and political correctness is ever present. In 1978, staunch antisemite Willis Carto founded the Institute for Historical Review (IHR.) Mr. Carto passed away last year but the website is still up and even though their administrator claim that they are not Holocaust deniers, their site is replete with books, videos, CDs and DVDs promoting that very view. It is interesting to note that a site called “Institute for Historical Review” almost exclusively deals with Holocaust denial and Jewish cabal theories. IHR is one of many websites promoting historical revisionism, yet they have in common to focus on Israel, the Jews and the Holocaust more than anything else. On one hand, it is only when it comes to the Holocaust that people come out of nowhere with a pseudo-scholarly approach to the Jewish tragedy. People like David Irving, Louis Faurisson, Roger Garaudy, Louis Farrakhan or Bobby Fisher are just a few names in the pantheon of antisemitism and Holocaust denial. It appears to be such an obsession for these men (and many more) to prove that the Jewish catastrophe was a hoax. On the other hand, very few people, if any, are interested in writing books trying to play down or deny events such as the Sudanese mass killings, the war in Kosovo, the Armenian genocide or even the Stalin massacres. All these tragedies (and so many more throughout history) were responsible for the death of millions of innocent people. When one evaluates the level of interest in denying the Holocaust as opposed to any other genocide, there is a flagrant imbalance. Why? Additionally, nobody seems to hold any ethnic group or sub-group corporately responsible for the ills inflicted by a small section of their community onto another ethnic group. This being said, we would even have to prove that Israeli Jews are guilty of ethnic cleansing against Palestinians, and they are not. But, let us assume that it is the case for a moment. The question would then arise:” Why should all Jews be equally responsible for what Israelis do to Palestinians?” Logically, they shouldn’t, right? But you see, antisemitism is highly illogical. Using the same logic, all Turks of all times should be held corporately responsible for the Armenian genocide of the 20th Century. There is certainly a small percentage of people who hate the Turks, but nobody sees all Turks of all times responsible by proxy. Yet this is exactly what looms over the global Jew wherever he is geographically or historically. Even Jewish people today–and as difficult as it might be–do not see all Germans as Nazis. So maybe, Holocaust denial is more about the demonization and ostracism of the global Jew than it is about historical revisionism. This would lead the world to consider the Jews as lesser important or even “sub-human”. This concept was exactly what Hitler used to justify the Holocaust. So wait a minute, Holocaust denial could lead to another Holocaust? It is exactly for that reason that we must continue to remember the Holocaust; because of Holocaust deniers. We must also continue to remember the Armenian genocide, but that one doesn’t seem to suffer at the hands of Armenian Genocide deniers (the same principle applies to all other genocides). Even though we continue to witness an increase in “Holocaust fatigue”, for as long as people try to tell us that the Holocaust never happened, it is OUR duty as decent human beings to continue to tell them and the rest of the world that IT DID happen, because very soon, all the first hand witnesses of the Catastrophe will be all gone. We cannot afford to forget. To deny is despicable. NEVER AGAIN! God Chose Jewish people as ROLE MODELS through Abraham God made His Covenant. King David’s descendant Messiah sent as promised Seed to save and redeem mankind. There is no point in getting angry over GOD’S DECISION by hating the messenger so get over it and come to terms with God and submit to God for own good. God is taking serious notice with consequences for all those Fighting against God’s Agenda. For all Israel shall be saved in Jesus Name. Of course I am not making this up check the links on the article. Perhaps God is nudging you to create a holocaust remembrance project with your pastor to inform and educate as a vessel of honour to GOD’S Glory. So think about it, Pray about it and and work to begin to prepare towards next year’s day as part of normal service. Pastors have too many things to remember by themselves without various members of the church reminding them in advance or creating memoirs on holocaust as part of a team’s input as faithful and dedicated members like yourself. Thank you for sharing, who knows maybe that is why God put you there for such a time as these. God bless you. In that case it’s really sad that this date is not remembered in our community or in our churches. I’ll e-mail you after Wed nights service (1/27) and let you know what the Pastor says. I appreciate so very much your expertise Olivier and my heart aches as I see the lack of interest in the Church to remember or even care about the Holocaust. Apathy has to stop now and we who claim to trust in Yeshua must voice our concerns within the Church and our community. I fear that G_d will shake this nation and the world in ways we never thought possible if we turn our backs on the Jews again, just as the Church did during WWII and throughout history. I truly think that many “Christians” still look at the Jews as the Christ killers. I heard at a Bible study someone say, “Jews are wealthy and only care about money”. I am ashamed to say that many Christians just do not care about the Jews and are more concerned about a Palestinian State than what the Jews suffered during the Holocaust. Thank G_d for the Christians who do love the Jews and speak out against all anti-Semitism! Just think what the world will say when Israel takes the west bank? 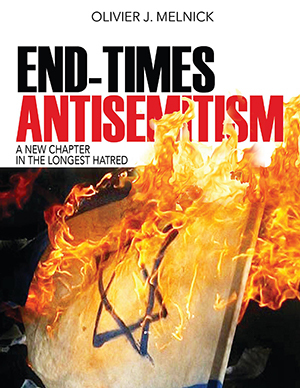 They hate Israel as it is and all holocaust denial is a pretext to support antisemitism. There is only one solution, bless Israel and support a one state which includes all of Samaria and Judea. This is the way to blessing.